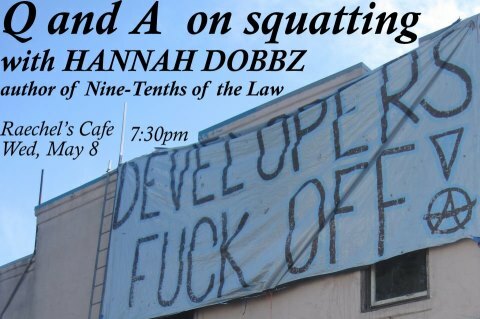 Former squatter and author of *Nine-Tenths of the Law* Hannah Dobbz will answer questions about squatting in the U.S with a facilitated discussion to follow on possibilities of (and the issues that arise from) squatting, housing and homelessness in Bloomington. Copies of the book and information on squatting will be available. Donations welcome as the author is on tour.